I had a great evening at the Victoria Square Style Soiree last week and thought you might like to see what I wore and check out some amazing pictures from the show. Thanks to Stephen Potter for providing the show pictures and to Kelvin Boyes from Press Eye for the photo of yours truly. A plain blazer, your usual jeans and a sparkly vest/t-shirt is a great look for a night out. It will flatter most body shapes and once you have the jeans and blazer (which you will wear endlessly), all you need to change your look is a new sparkly vest. I got this one brand new on eBay - the large grey dull sequins caught my eye and I knew they would work really well with my grey jeans. But onto the real fashion of the night - styled by Rebecca McKinney, Personal Stylist at Victoria Square and featuring gorgeous NI models, Nuala Meenahan, Joanne Salley, Carys Magill, Jayne Higgins and Miss Northern Ireland, Tiffany Brien..
What a great ebay buy, I love your sequin top! Looks like a fab event with some gorgeous looks on that catwalk! I like the VB pose though you are smiling considerably more than VB. This fashion show business looks great fun - I want to come! 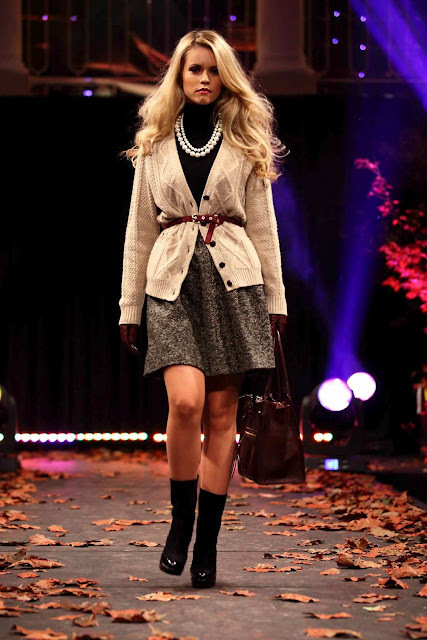 Love the outfits with brown belted jacket & the one with aaron cardi. You look fabulous - sounds like a great night. I love that orange coat from Hobbs ! loved your outfit! looks like a fun event! Great look and love all the runaway outfits!! You look AMAZING!! That's a "night out on the town" outfit. Love the ourfit and especially the top! What a great fashion show!! ANd you look stunning!